Mars remains an evening object. It is low in the southwest at dusk. Saturn is now in the west-southwest at dusk for one more month. By month’s end, it sets just after twilight ends. Jupiter emerges higher into the morning sky this month. Look for it high in the south at dawn; it outshines all stars in that direction. Venus remains high in the east at dawn, continuing a spectacular morning apparition. The Big Dipper is to the lower left of the North Star at dusk, with its handle pointing up and to the left. From that handle, you can ‘arc to Arcturus’, which is in the west at dusk. 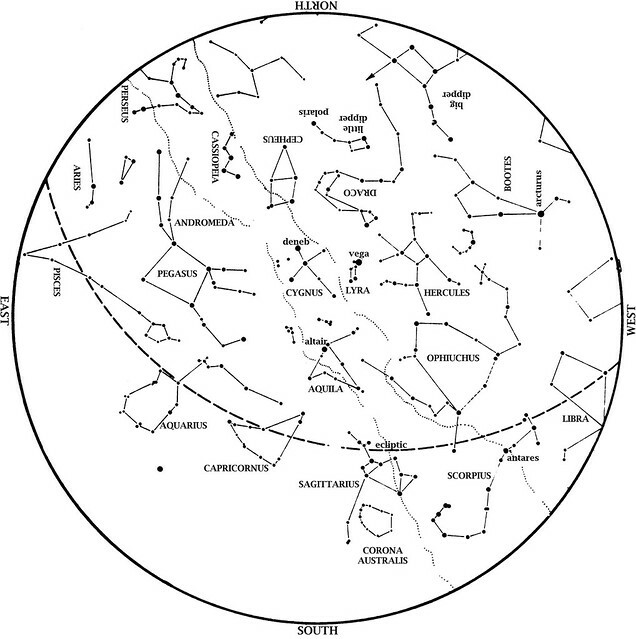 This star map shows the Houston sky at 10 p.m. CDT on Sept. 1, 9 p.m. CDT on Sept. 15, and at dusk on Sept. 30. To use the map, put the direction you’re facing at the bottom. Antares, the brightest star of Scorpius the Scorpion, is in the southwest, with the ‘teapot’ of Sagittarius behind it. The Summer Triangle approaches the zenith (overhead point). Pegasus, with its distinctive Great Square, has risen in the east. At 9:47 a.m. on Saturday, September 22, the Sun is directly overhead at the equator, shifting towards the south. This, then, marks the autumnal (fall) equinox. On this date, everyone on Earth has the same amount of daytime and nighttime. Ever since the spring equinox in March, daytime has been longer than night for us in the Northern Hemisphere, while the reverse has been true in the Southern Hemisphere. After September 22, night is longer than day for us and the day is longer than the night below the equator. The Full Moon of Saturday, September 29 is the Full Moon closest to the autumnal (fall) equinox. This, therefore, is the Harvest Moon. The angle between the ecliptic — the plane on which the Sun, Moon, and all planets appear — and the horizon is always shallowest near the fall equinox. As a result, moons near full phase at this time of year rise at almost the same time each night for a few days in a row. Farmers used this light to keep working their fields long into the night at harvest time. Would you like email updates on current events in the sky, at the planetarium, and at the George Observatory? If so, send an email to astroinfo@hmns.org.